REHOBOTH, Mass. 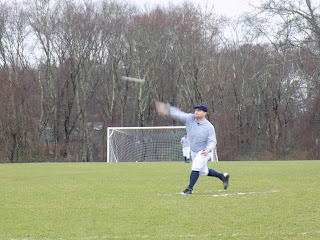 -- The lines were drawn on a soggy field in all-purpose flour just as the rain tapered off. 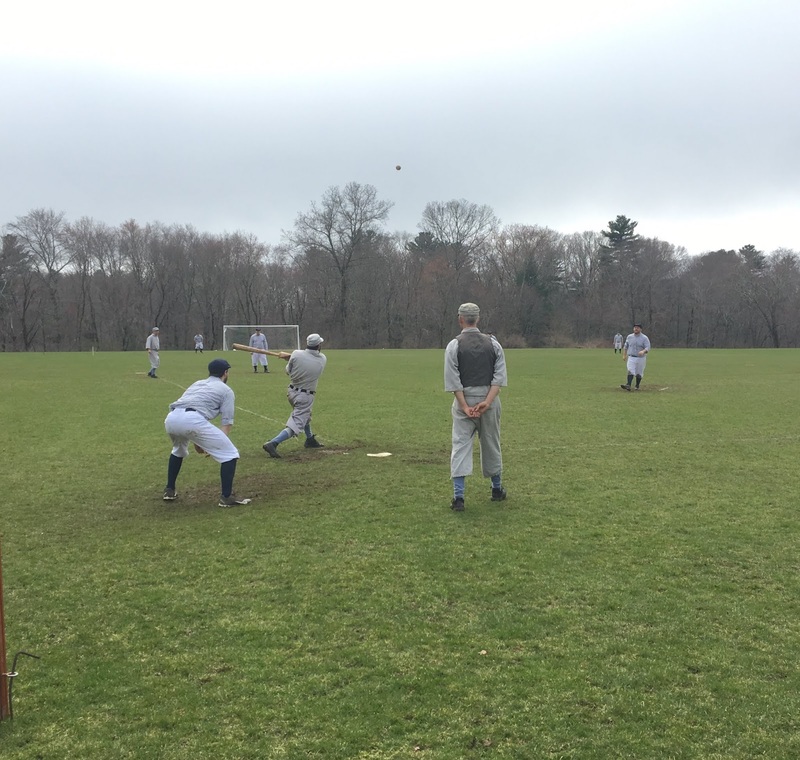 The Providence club played host on Saturday, April 13, to inaugurate the Boston Union BBC with an ‘84/’64 doubleheader at Milot Field in Rehoboth, Massachusetts, and the weather cooperated nicely. 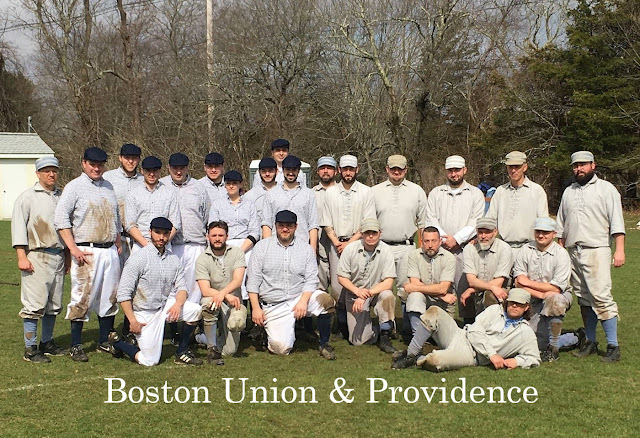 The Union debuted with a strong lineup packed with many veteran ballists, but the day would belong to the Rhode Islanders, with the Grays taking the 1884 match 20-1, then prevailing in the 1864 battle 26-14 through nine tough innings. 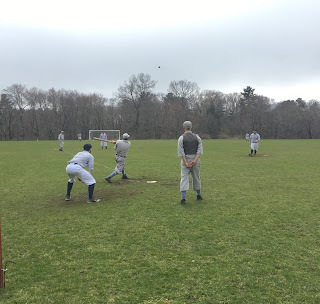 Boston led off in game one (1884) and got to work straight away, drawing a walk and, with a couple of stolen bases, tallied an ace before Providence could record an out. With one down and a runner on first, the Grays closed out their first defensive inning of the season with a 6-4-3 double play, as shortstop Mike “Banquet” Swanson snatched up a well-hit grounder, transferred to get the lead runner at second to Jon “Bones” Henson, who made the turn for Captain Brian Travers at first to retire the side. Johnny Carlevale made his base on balls to open the offense for Providence, then quickly stole two bases and scored on a sacrifice off the bat of Travers. Banquet Swanson singled and scored as Tony McClellan reached first safely on an error. Greg Smith drew a walk in the clean-up spot before Jerry McCormack would drive a long, 2-RBI single to round out the Grays scoring, 4 to 1 after one. The Union opened the top half of the second frame with two solid hits but gave up a hand when a runner was caught off the bag with the ball in close proximity, in the hands of first baseman Travers. With a Union runner threatening to score at third, Grays pitcher Connor Pirruccello-McClellan fanned two batters in quick succession to hold the score at 4 to 1. The Grays’ bats came alive in their second inning, with singles by Travers, Banquet, Carlevale (2), Smith (2), McCormack, and Henson, and doubles off the bats of Travers, McClellan, and Pirruccello-McClellan. When the third out was made, Providence had plated 15 runs in the frame to advance the lead to 19-1. Pirruccello-McClellan picked up two more Ks and gave up a walk in the top of the third before Tony McClellan made firm his grasp of a foul tip behind the plate to close out the frame. McClellan would open the Grays’ third by making his first on a Union error, and then Boston retired the next three Providence batters in order to return to the plate. The Union came heavy to open the fourth, with two consecutive well-struck singles before newcomer Ryan “Loggy” Logsdon recorded his first career put-out, gripping a high fly to right for the first hand. Another Union single loaded the bases, but one more Pirruccello-McClellan K and a well-fielded grounder to rookie RJ Zimmerman at second put the bats back in the hands of the Providence squad. Pirruccello-McClellan would help his own cause, leading off the bottom of the fourth with a single, a stolen base, and an ace tallied to round out the scoring for Providence at 20. Zimmerman retired the first Boston batter in the fifth, catching an infield fly at second before the next batter reached safely on a Providence throwing error. After a stolen base, a dropped pop fly to short put the runner in motion and resulted in a put-out at third. Third baseman Smith retrieved a foul fly ball for the third out as well as the decision: Providence 20, Union 1. Catcher Johnny Carlevale led things off for Providence in game two (1864) with a base knock and two stolen bases. Travers drove him in from third with a sac fly to left. Singles also came off the bats of Smith, McCormack, and Henson, with three runs scored to open the inning. Boston came right back with two hits and two runs for a 3-2 score after one. A Travers single in the second frame scored Carlevale from third, and a Boston foul tip bounce out and two outs on the fly, including an excellent grab by center fielder Drew Ewing, rendered their half inning scoreless to fix the score at 4-2 at the end of the second. McCormack knocked a lead-off single to open the third then stole bases and scored on a towering sacrifice fly to left from Bones Henson. Loggy singled and eventually scored on a passed ball to increase the Grays’ lead to four (6 to 2), but Boston notched another tally in their third on two hits and an error to finish the inning trailing by three, 6-3. 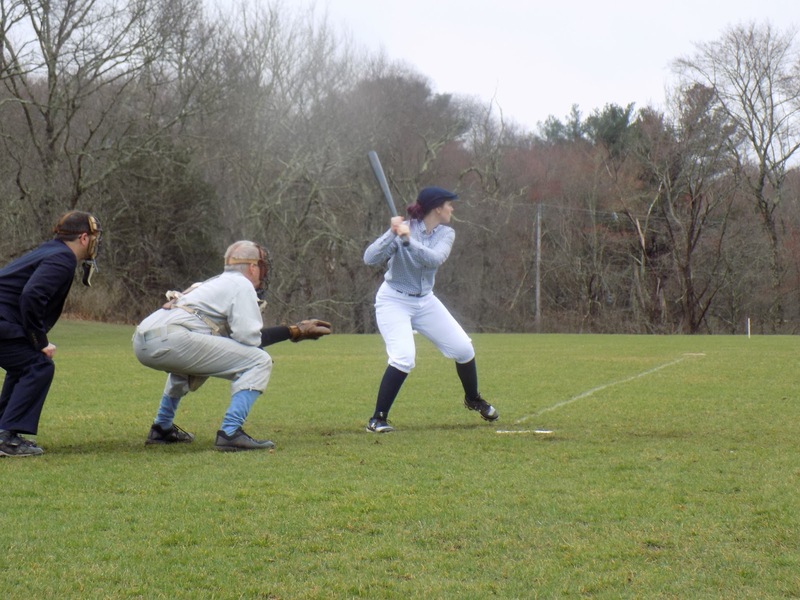 Carlevale, Travers, Smith, McCormack, shortstop Dave “Grandpa” Watson, and Henson added six runs for the Grays in the fourth off a single from left fielder Jamie Maynard and a double each from Smith and McCormack. Boston scored four of their own off three hits to settle the score at 12-7 after four full innings. Smith’s single in the fifth was the lone Grays success at the plate in the frame before the Union added three runs in the bottom half to narrow the Providence lead to two, 12-10. Right fielder Zimmerman opened the Providence sixth with a single and a stolen base, then scored on a sacrifice from Maynard to push the Grays lead to three, 13-10. Boston sat down in order for their sixth, highlighted by a brave snag of a high line drive by first baseman McCormack unassisted for one of those three hands. Travers opened the seventh with a lead-off single but, after stealing two bases, was stranded at third as the next three Grays batters each flied out. Boston again put up three batters in the seventh, and each was retired off Travers smart pitching and plucky Grays defense to hold the score at 13-10 after seven. 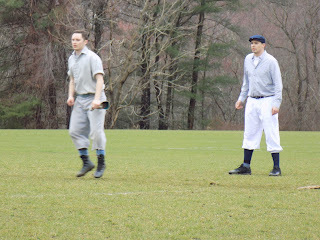 The eighth inning was another Providence offensive bonanza, with singles from Carlevale, Banquet, Grandpa, Henson, Zimmerman, and Pirruccello-McClellan, and doubles from Travers, Banquet, and Maynard that added 13 more runs for the Grays, doubling their total tallies for the game to 26. The Union added another run on two hits, to set the score at 26-11 after eight. Grandpa reached on an error to start the ninth but ultimately was stranded at third as the Providence bats fell silent for the day. Boston was stopped at the bottom of the final inning after putting up three more runs, to fix the final score at 26-14 in favor of Providence. 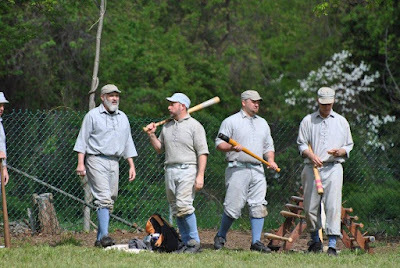 The Grays will be idle for the upcoming Easter weekend and will return to action on April 27-28 as they travel to Smithtown, N.Y., to participate in the 1864 Atlantic Festival, facing the Lisbon Tunnelmen, Mountain Athletic Club, Talbot Fairplays, and Brooklyn Eckfords over two days. Stay tuned to the Grays Facebook page for a festival preview as the dates draw nearer.